John Howie was born in Chicago and moved to the Seattle area in the late 1960’s, beginning his culinary career at age 15. His training ground was many of Seattle’s finest restaurants. As opening chef at Palisade Palisades in June of 1992 and during his ten-year tenure, the restaurant gained the status of Seattle’s premier special occasion destination dining spot. John gained notoriety for bringing unique, specialty foods to the Seattle table. He originated the use of planks for restaurant service and launched a culinary website "plankcooking.com." John has also authored two cookbooks for plank cooking, "The Cedar Plank Cookbook" and “The Plank Cookbook." On March 11, 2002 he opened Seastar Restaurant and Raw Bar in Bellevue – a culmination of his dream to showcase the best of the Pacific Northwest in both quality and preparation, in his own establishment. John and Seastar have been honored and praised in many publications, radio and television shows both locally and nationally including Food & Wine, Wine Spectator, Sunset, Martha Stewart Living, CBS Early Morning Show, ABC’s Good Morning America, CNN, Food Network, Wine Spectator, Sunset Magazine, and KING TV 5 Evening Magazine. The restaurant received the highest rating in the 2008 and 2010 Zagat Survey for “Top Cuisine – Seafood” and “Top Cuisine - Raw Bars” in a city lauded for its seafood establishments, as well as top ratings in “Most Popular," “People Watching,” “Power Scenes,” “Service” and “Décor." In January of 2005 John joined forces with several sports celebrity investors and opened SPORT Restaurant & Bar – a high tech sports restaurant that serves everything from Kobe beef burgers and thin crust pizza to prime steaks and meal-sized salads. This casual yet sophisticated restaurant is outfitted with huge HDTV’s as well as personal televisions, which allow guests the option of watching events of their choice from the privacy of a booth while dining. SPORT features a specially outfitted broadcast table where celebrity interviews and pre- and post-game shows for the Sonics and Mariners are broadcast. He launched Adriatic Grill Italian Cuisine & Wine Bar in early 2008 with partner Chef Bill Trudnowski. Located in Tacoma, Washington, the restaurant features fresh seasonal cuisine from the countries that border the Adriatic Sea. John started the new year by opening a spectacular new Seastar Restaurant & Raw Bar in Seattle on January 27, 2009 – within the 2200 Westlake project and a short walk to Seattle’s downtown retail, arts and theater corridor as well as Seattle Center. Located adjacent to the Pan Pacific Seattle Hotel and upstairs from Whole Foods Market, the restaurant includes a spacious dining area seating 150, a separate bar seating 50, a private dining room and outdoor “al fresco” dining. On September 12, 2009 he opened his signature steakhouse – John Howie Steak, located at Bellevue’s chic new shopping area known as “The Shops at The Bravern” (anchored by such ultra-luxury stores as Neiman Marcus, Hermes, Louis Vuitton, Ferragamo and Jimmy Choo Shoes). The 9,000 square foot venue features two private dining rooms and a piano lounge. Guests can look forward to an incredible dining experience with hardwood grilled USDA Prime steaks; Chateaubriand and Rack of Lamb served tableside; artisan cheeses; the Northwest's best selection of single malt scotches and cognacs; and a grand selection of Washington and international wines by the bottle, or by the glass from the Enomatic wine preservation systems. 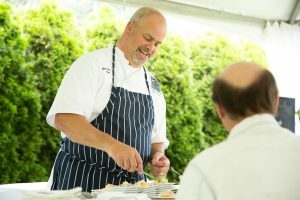 John has been honored with an invitation to cook at the prestigious James Beard House in New York City on five separate occasions and represents Washington State annually at the SuperBowl in The Taste of the NFL. He is a repeat guest at the Epcot Food & Wine Festival, the Naples Food and Wine Festival, and has been a guest chef on Holland America cruise line. John received a rarely bestowed Excellence Award from the mayor of Bellevue and the Overlake Service League recognizing his outstanding community service. Seastar Restaurant and Raw Bar is honored to be the winner of the 2008 Washington Good Neighbor Award and has donated over $600,000 in time, services, gift certificates and in-kind goods, generating over $2,000,000 in charitable giving to date. The restaurant was also awarded top honors at the 2008 Crystal Beverage Awards, garnering “Best Bar Program” - AWARD OF PRESTIGE and “Best Wine List (301 - 1000 Selections)” - AWARD OF PRESTIGE. Seastar’s wine list has again been recognized with the 2009 Wine Spectator Best of Award of Excellence.